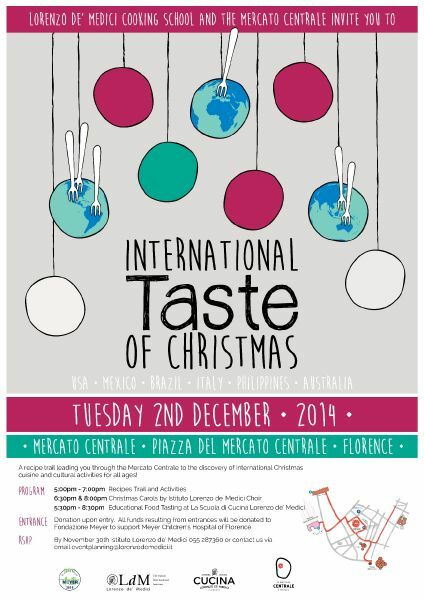 One passport to travel a recipe trail along 6 different countries: that’s all it takes to participate in this year’s International Taste of Christmas event organized at the Mercato Centrale by our Event Planning students. Various activities will take place during this tasty and appetizing evening: the passport you receive at the Info Point will allow you to travel from the USA to Italy and from Australia to Mexico, learning and tasting different things about Christmas traditions in these countries. Activities for children include cookie decorating and special Christmas games & entertainment. Musical interpretation is provided by the Fall 2014 Istituto Lorenzo de’ Medici Choir at 6:30 & 8:00 PM. Once ‘travelers’ finished the recipe trail, an educational food tasting will await them at the Cucina Lorenzo de’ Medici. All funds resulting from the event will be donated to the Fondazione Meyer to support the Meyer Children’s Hospital of Florence.